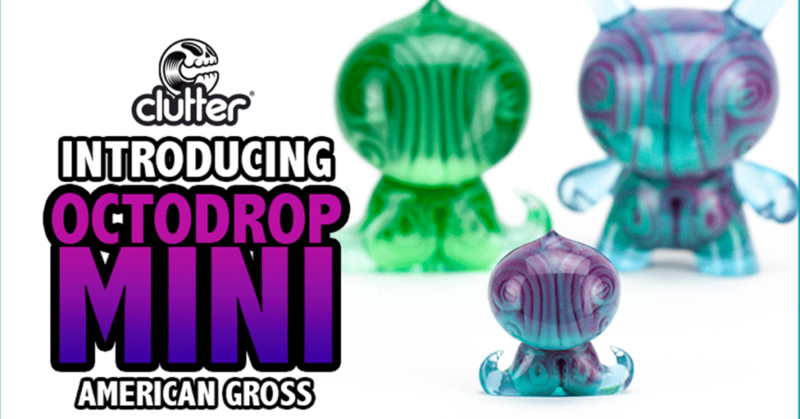 Introducing: Octodrop Mini by American Gross x Clutter Studios! Oh, so tiny & pretty! Just like its creator, Octodrop Mini are now a real thing. Following a number of previous releases of Octodrop, American Gross has gone all ‘Honey, I’ve Shrunk the Octodrop’ on us and released the Octodrop Mini in a Purple Teal resin colourway! Now available 2inches tall, Octodrop Mini is hand-sculpted by American Gross and produced by Clutter Studios. Cast in teal and purple gossamer resin with an external pale blue skin. The Octodrop Mini is the perfect companion to your OctoDunny, OctoDrop and Taku Taku collection! Priced at $50 (about £38) each plus shipping. These are a pre-order and you can expect these to ship at the end of June. You can snag your Octodrop Mini HERE on the Clutter online store! Oh, and boy do these Octodrop Mini glow in the dark! Yup! Look at that glow! Beeee….auuut…iful! The Octodrop fam is growing nicely! Which colourways would you like for American Gross to drop next? Hit us up in the comments!